Spindrift Couloir lies on the North Face of Big Four Mountain, an imposing 4,000 foot wall rises less than a mile from the Big Four pinic area on the Mountain Loop Highway. The low elevation summit stands only 6,000 feet high, and much of the face is brushy in the Summer, but during the Winter it can be a snow and ice climbing dream in the right conditions: typically after warm weather brings rain to the summit and then a cold snap follows. The face was first climbed in the '40's, and in the '70's climbers began exploring it as a Winter destination. 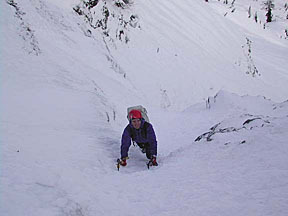 Spindrift Couloir was climbed in March, 1996, by Bart Paull and Doug Littauer, who published their climb in the American Alpine Journal the following year, but it has subsequently been reported that others probably climbed the route in the late '80's. The approach to the climb follows a nature trail and is nearly accessible by wheelchair. Signs warn of a serious avalanche hazard in the Winter, and tourists have been killed when the ice caves at the bottom of the face collapse on hot days in the Summer. From the end of the trail, where it enters the open basin below the Face, bear right to find a break in the cliffs somewhat right of the steepest part of the lower headwall. In times of very low snow, the easiest start may involve crawling through the bushes on the far right, but when the climb is in shape a viable route should be found more or less directly leading to the climb. 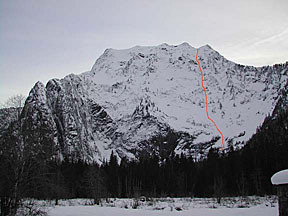 The couloir is largely relatively low angle, but several steeper sections follow in cascading steps. 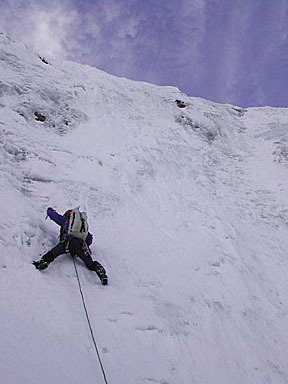 The crux comes about about 3/4 height, with a 100 foot pitch of near-vertical ice leading to steep snow, often runnelled, up to the exit pitches. The climb tops out on the summit ridge, well west of the Summit. The descent is made to the Northwest, via rappels and steep downclimbing to reach the col between Big Four and Hall Peak. 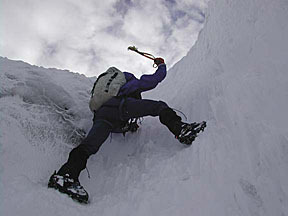 One major subsidiary SW ridge must be rounded in order to make the descent to the col, and a 2003 party mistakenly descended to the creek south of the peak in poor visibility. In proper conditions, the North Face of Big Four Mountain offers some of the most easily approached "alpine" climbing in the Cascades. Several variations are possible on this face, and the Spindrift Couloir is by no means the only worthy line.